Iran's reformist president has escalated his battle with hardline clerics by threatening the resignation of his entire administration. Mohammad Khatami said his government would "go together" if a ban on reformist candidates standing in next month's election was not lifted. He described the ruling as biased - his toughest pronouncement yet, says the BBC's Jim Muir in Tehran. But the president said he was hopeful that talks could solve the crisis. The conservative Guardian Council - which vets candidates - is now considering appeals against its own veto of more than 3,000 would-be candidates. Of those, about 80 are sitting members of parliament. The Council - empowered to ensure parliament's actions comply with Islamic principles - says it will not yield to pressure in its consideration of appeals. Reformist officials had already made clear that several ministers, lawmakers and advisers would resign if the ban was upheld. 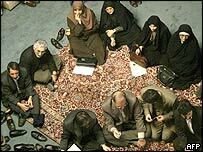 But on Tuesday President Khatami said his administration would resign en masse. "We will go together or we will stay together," he said. "At this stage, my historic mission is to prevent the illegal seizing of the levers of power," he said. Your views: Can the row be resolved? But he also said he was "not despairing", and that results could be achieved if consultations continued, and if the standards laid down by Supreme Leader Ayatollah Ali Khamenei were adhered to. Ayatollah Khamenei has said the controversy must be resolved through legal channels. The Guardian Council affirmed that it would do so, the official IRNA news agency quoted spokesman Mohammad Jahromi as saying. But he also warned that the council would not be moved by "pressure or commotion". Following legal procedure means disputes continuing for more than two weeks until the results of the reconsideration are known, says our correspondent in Tehran Jim Muir. It is a tug-of-war in which both sides are trying to maximise their pressure on the appeals process, he says. The government is dominated by reformists, and their mass resignation would see almost all democratically elected officials out of office ahead of the elections on 20 February. At least 80 reformist deputies are continuing a sit-in inside the Iranian parliament, where the tension has boiled over into occasional fist-fights. Among those banned from putting their name on ballots are Mohammad Reza Khatami, the younger brother of the president, and Behzad Nabavi - who are both deputy speakers of parliament. "Mr Khatami's speech is uncharacteristically fiery"